By now it’s time to finalize a meaningful phase in the Quartet construction process – and finally close the “body” of each instrument. 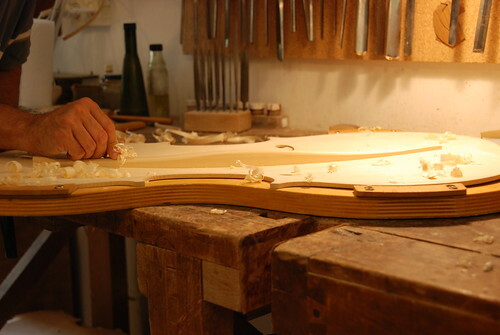 As you may remember, at the beginning of the process, Yonatan started with a wooden mold, on which he glued first the ribs and then the back of each instrument. 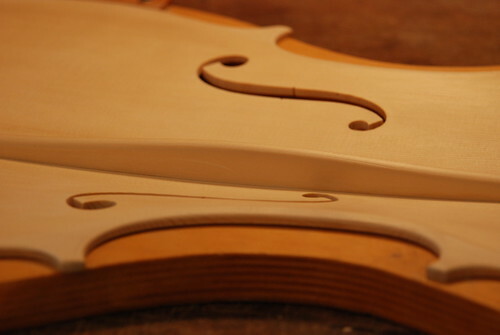 Meanwhile, as I have told you, the sound boards of the cello and the viola have been constructed – including cutting the “f‘s” and reaching the exact “spessori” (thicknesses). But one step remains before the “body” of each instrument is closed. It’s an extremely important and very technical step – fitting in place and shaping the bass-bar (catena in Italian, read ka-tè-na). What the hell is the bass-bar? Well, bear with me for a minute and imagine a violin…. you know how the strings all “sit” on a wooden bridge? So this bridge has two legs, each of which is supported from underneath (that is to say, from inside the violin – or from underground if you wish). The side of the bridge where the high strings are located is supported by the sound-post (anima), which I’ll get to at a later stage. The second leg of the bridge, where the bass strings are located, is supported – - you got it – - by the bass-bar. This bar is actually a long, thin, curvy piece of wood that needs to be glued to the inside of the sound-board. Sounds simple? Well, it ain’t necessarily so… the bass bar needs to fit in a most exact manner to the arched underside of the sound board. It also needs to have exactly the right tension, be connected at exactly the right location, at exactly the right angle and about a dozen additional “exactlies” that are related to the properties of the wood, the model you picked, the violin-making school you follow and the-angle-of-sunlight-on-the-longest-day-of-the-year-in-the-equator… no, I guess everything but that last one. 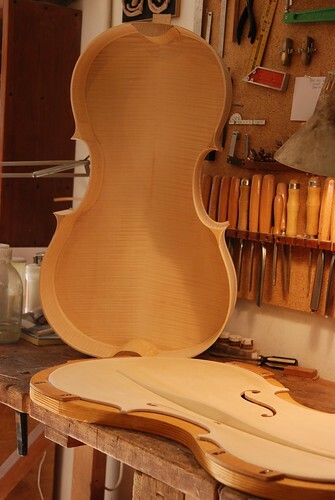 As I wrote a few weeks ago, the process of working on the sound-board, cutting the “f‘s”, fitting and gluing the “catena“, gluing the back into place, removing the mold and finally, finally closing the body was all completed first for the cello. This is important for Yonatan, as it allows him to concentrate on finishing the body of one instrument before moving on to the next. 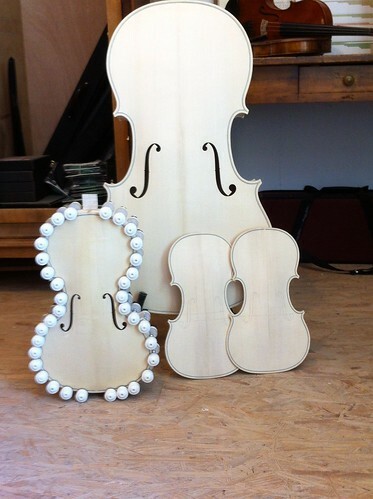 …and here is the entire Quartet, with the viola newly-glued (kinda’ like newlywed…) so still with the special clamps all around it, and the cello already closed and dry behind it. Pretty cool how they are actually starting to look like instruments, right? Now I have a question for you – what could be better than going to a concert and seeing Yonatan’s sister play one of his instruments on stage? I thought nothing could surpass that experience… until last night we went again to the same Rita concert where Galia plays a major part on the “Golden Viola” he had made especially for her. Apparently, one of the other musicians that has a major role – he plays a special Persian violin called Kamancheh – couldn’t come to that concert. Galia had to play his part too, and she did this on Yonatan’s violin. As we summed up what was a truly breathtaking concert: Yonatan had two instruments and a sister on stage!! Making a quartet is a "tour de force", congrats to your husband!!!! Thank you. A very interesting view of making a quartet. 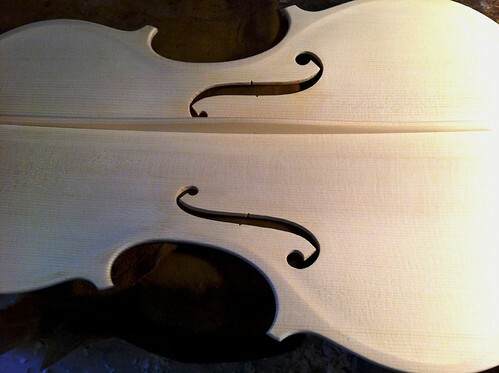 Looking at the inside of the cello, I can see the grain of the wood that is apparent on the back of the instrument. It looks like it is going to be fantasic when your husband applies the varnish! I look forward to seeing the quartet complete. I'd love to play one! 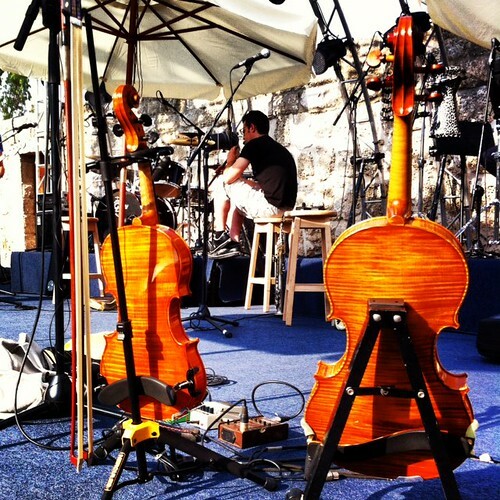 The golden viola and the violin are beautiful! Thanks for the series. Of course I know what a bass bar is, but I always forget exactly what its form is. I'm surprised anew each time I see one-- its form isn't intuitive to me. Yes, these instruments are beautiful, but so are the photographs! You should consider authoring a coffee-table style book on violin-making that would perhaps combine the technical aspects (as you have blogged here) with your photography of the process. I would buy it!